The All New 2019 Sprinter Van has arrived!! Equipped with the Driver Convenience Package, Bench Seat Package, Assist Handle w/ Partiton, Cargo Partition, Fuel-Fired Pre-Heater/ Booster and much much more! Reach out to our fleet manager Vince Pelkman today to arrange a viewing and test drive. The state of the art facility at Mercedes-Benz Country Hills provides customers with an experience unlike any other. 3 lane service drive thru, 30 service lifts, Mercedes-Benz parts specialists and boutique, AMG Performance Center, the Benz Bistro, and Country Hills Kids Club are all here for your benefit. If you should have any questions regarding this vehicle or another in our inventory, please give us a call (403-930-7778) or pay us a visit at Mercedes-Benz Country Hills. Price includes $785 in dealer fees and levies. NO HIDDEN FEES. Plus GST. The All New 2019 Sprinter Van has arrived!! Equipped with Navigation, Cutoff Relay for Additional Battery, Heated Driver Seat, Trailer Hitch, 5000 lbs, Driver Convenience Package and much much more! Reach out to our fleet manager Vince Pelkman today to arrange a viewing and test drive. The state of the art facility at Mercedes-Benz Country Hills provides customers with an experience unlike any other. 3 lane service drive thru, 30 service lifts, Mercedes-Benz parts specialists and boutique, AMG Performance Center, the Benz Bistro, and Country Hills Kids Club are all here for your benefit. If you should have any questions regarding this vehicle or another in our inventory, please give us a call (403-930-7778) or pay us a visit at Mercedes-Benz Country Hills. Price includes $785 in dealer fees and levies. NO HIDDEN FEES. Plus GST. The All New 2019 Mercedes-Benz Sprinter V6 2500 Cargo 144 has arrived!! Equipped with the Tray For Smartphone Incl. Wireless Charging, Additional Battery for Retrofit Consumers, Engine Compartment, Navigation, Trailer Hitch, 5000 lbs, AGM Battery 12 V 92 AH 850 A, Driver Convenience Package, Acoustic Package and much much more! Reach out to our fleet manager Vince Pelkman today to arrange a viewing and test drive. The state of the art facility at Mercedes-Benz Country Hills provides customers with an experience unlike any other. 3 lane service drive thru, 30 service lifts, Mercedes-Benz parts specialists and boutique, AMG Performance Center, the Benz Bistro, and Country Hills Kids Club are all here for your benefit. If you should have any questions regarding this vehicle or another in our inventory, please give us a call (403-930-7778) or pay us a visit at Mercedes-Benz Country Hills. Price includes $785 in dealer fees and levies. NO HIDDEN FEES. Plus GST. The All New 2019 Mercedes-Benz Sprinter V6 2500 Cargo 170 has arrived!! Equipped with a higher Gross Vehicle Weight Rating of 9050lbs there have been many thoughtful and practical updates on the all new 2019 Sprinter. Now equipped with a new 7 Speed G-tronic transmission which provides better fuel economy and delivers more power from our work-horse 3.0 litre V6 Diesel. With the longest service intervals in its class of 30,000km between oil changes, the Sprinter keeps you working longer with less down time. Class Leading stand up height, plus the largest cargo area and payload in it's segments the Sprinter is ready to work for you. An improved ride quality and many available new tech features including an 7" or 10.5 inch touch screen, power sliding cargo doors, Attention Assist, Blind Spot Assist, Collision Prevention Assist and Distance Cruise Control the Sprinter has all that you need in spades. New and improved Van Service Care programs can cover you for your basic services or cover all your maintenance plus wear and tear items. Lease or Finance for 5 years at 3.99%. Winner of Vincentric Best Fleet Value and Lowest Overall Cost of Operation for 8 years in a row!! 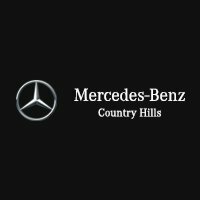 Contact Mercedes-Benz Country Hills at (403) 930-7778 and experience the difference!! The All New 2019 Sprinter Van has arrived!! Equipped with a higher Gross Vehicle Weight Rating of 9050lbs there have been many thoughtful and practical updates on the all new 2019 Sprinter. Now equipped with a new 7 Speed G-tronic transmission which provides better fuel economy and delivers more power from our work-horse 3.0 litre V6 Diesel. With the longest service intervals in its class of 30,000km between oil changes, the Sprinter keeps you working longer with less down time. Class Leading stand up height, plus the largest cargo area and payload in it's segments the Sprinter is ready to work for you. An improved ride quality and many available new tech features including an 7" or 10.5 inch touch screen, power sliding cargo doors, Attention Assist, Blind Spot Assist, Collision Prevention Assist and Distance Cruise Control the Sprinter has all that you need in spades. New and improved Van Service Care programs can cover you for your basic services or cover all your maintenance plus wear and tear items. Lease or Finance for 5 years at 3.99%. Winner of Vincentric Best Fleet Value and Lowest Overall Cost of Operation for 8 years in a row!! Contact our Vans Specialists Vince Pelkman, Manager or Haris Muhammad, Van Specialist at Mercedes-Benz Country Hills at (403) 930-7778 and experience the difference! !